Global Impact is a leader in growing global philanthropy. The organization works towards bettering the world by providing integrated, partner-specific advisory and secretariat services; campaign design, marketing and implementation for workplace and signature fundraising campaigns; and fiscal agency, technology services and integrated giving platforms. GGlobal Impact partners with hundreds of public and private sector workplace giving campaigns to generate funding for an alliance of more than 100 of the most respected international charities. Through these partnerships, Global Impact meets real needs with real results by supporting programs focused on clean water, disaster relief and resiliency, economic development, education, environmental sustainability, global health and child survival, human trafficking, hunger, malaria, and women and girls. All content courtesy of FINCA International, Inc..
For more than 130 years, HIAS has been helping refugees rebuild their lives in safety and freedom. All content courtesy of HIAS. 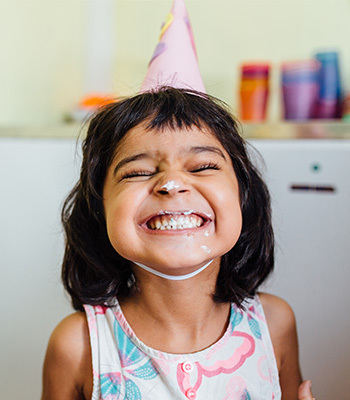 SOS Children's Villages - USA provides loving, stable homes for orphaned, abandoned, and other vulnerable children across 134 countries and territories, including the United States. All content courtesy of SOS Children's Villages - USA. Europe is home to 733 million people, 11 percent of the world’s population. Though there are no developing countries in the region, it struggles with economic stability and a major influx of migrants in the last three years has strained resources and lead to political divides. About 118 million people, or 23.5 percent, of the European population are at risk of poverty or social exclusion. Of these, 26 million are children. Fifty million Europeans live in households where no one has a job. Forty-three million Europeans are unable to afford a meal with meat, fish or a vegetarian equivalent every second day. In the year to March 2017, over 1 million refugees sought safety in Europe. The Global Impact Europe Fund brings together three of the most respected, best-in-the-business international organizations focused on helping those in Europe: FINCA International, SOS Children’s Villages – USA and HIAS. Through this fund, you will join with millions of people to change the world by helping to provide increased access to healthcare and education, job training, women’s and youth empowerment, disaster relief, and a host of other services to those in need throughout Europe. Your contributions go directly to supporting real and meaningful work to improve the lives of those living across Europe. 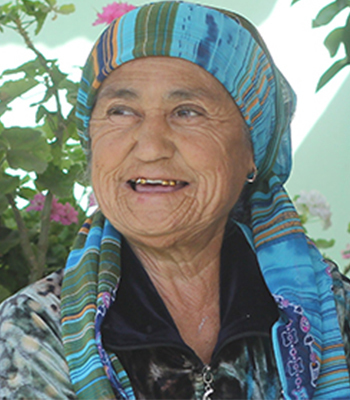 Lala Yolchiyeva lives in Ponichala, on the outskirts of Georgia’s capital Tbilisi, with her husband, their son and her husband’s parents. To help support the family, she harvests vegetables on a small farm and then sells her vegetables at the local market. Ten years ago, Lala was concerned that she wasn’t making enough money to support her family. She wanted to increase her farm’s productivity but didn’t know where to turn to get the funds to buy more seeds. In 2008, Lala turned to FINCA. She received a $500 loan to purchase more vegetable seeds and fertilizer. Over time, Lala was able to increase her harvests and made more money from selling her produce in the market. She combined her increased profits with the savings she had accumulated to buy a used car. The car helps her transport her vegetables to the market in Ponichala. Having the car has also made it possible for her to sell her produce in a bigger market in Tbilisi, where she can earn more money. To many, the Greek Islands conjure images of white sandy beaches and turquoise blue water. But for thousands of traumatized and desperate asylum-seekers, it is the place where their journey to safety and freedom came to an abrupt halt. Over the past two years, as some nations closed their borders, many who fled war and persecution in other parts of the world wound up stuck in Greek reception centers and group housing, waiting for interviews and uncertain about their futures. Some have reported waiting more than six months to be registered by the Greek Asylum Service. On July 1, 2016, on the Greek island of Lesvos, HIAS launched its newest international office in order to provide assistance to refugees and asylum-seekers facing an unfamiliar and daunting legal bureaucracy. “People have lots of questions and very few places to turn for answers. 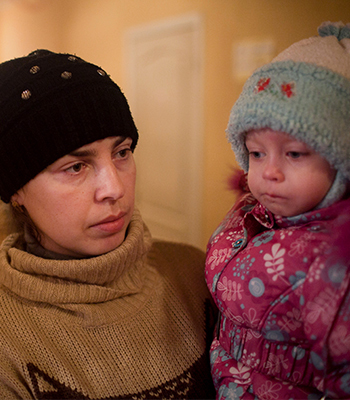 We are a crucial resource for them during a difficult time,” Levitan explained. Since the beginning of 2015, more than a million refugees have attempted the dangerous journey between Turkey and Greece. A majority arrived on the Greek island of Lesvos, considered the “gateway to Europe” for refugees and asylum-seekers. Like so many other refugees, Leila, her husband and their one-year old daughter made the decision to leave their home country, hoping for a safer future. They paid a smuggler to get them from Syria to Turkey and then from Turkey to Greece. With the eyes of the world on Greece, volunteers arrived from all over to meet arriving boats on the beaches and to provide for basic, material needs: clothing, food, transportation. But with the rules ever-changing, there was an unmet need for legal assistance as well as humanitarian aid. HIAS stepped in to provide legal assistance and advice to refugees like Leila, who are trying to reunite with family members in other E.U. countries or need a safe place to restart their lives. HIAS Greece’s legal team began taking cases in July. The dedicated staff include Greek lawyers, Arabic-, Dari- and English-speaking interpreters, a legal advisor and a field coordinator. The team provides legal aid and representation for particularly vulnerable refugees, including unaccompanied minors, older people, refugees with disabilities, and separated families. They also provide information and group presentations explaining legal rights and processes to refugees who would otherwise have no one to turn to. Since becoming operational on Lesvos, HIAS Greece has screened hundreds of claims, formally taking on more than 130 cases totaling over 350 individuals. The focus is on Syrian, Afghan and Iraqi cases, but others are considered on a case-by-case basis. Legal assistance is provided free of charge, with an emphasis on helping the most vulnerable. The crises which created so many new refugees over the past few years have not abated, and in fact new families and individuals continue to arrive on Lesvos. HIAS’ Greece program was created to advocate for families hoping to be reunited and assist those who are struggling in complex, unfamiliar circumstances. For refugees like Leila, who can now access crucial legal services, help has not arrived a moment too soon. The bicycle is becoming much more than a way to get around. With the help of SOS Children’s Villages, young refugees and Italians in Crotone, Italy, are learning how to maintain and build bicycles through a programme designed to improve their life and career skills. The bicycle mechanics course began in February for unaccompanied and separated children living at refugee settlements near the southern city, as well as children from the surrounding community. The course is divided into seven sessions aimed at giving adolescents the opportunity to learn skills and practice teamwork. The course teaches specialised mechanics and draws together participants who are from diverse cultures and backgrounds. "I'm very interested in learning, because it can be important for my future," says a youth from Mali, one of the nine young participants in the course. A boy from Crotone who joined the bicycle workshop says: "The practice is the part that I like. Even if there is something I cannot do, I try and try again and then I can do it." Giuseppe Aiello, President of the Ciclofficina TR22o bicycle association in Crotone, says the course offers the young Italians and refugees an opportunity to learn skills, interact with the local community and have a good time. "The goal is to let them have fun and learn new skills through a constructive approach. Moreover, the interaction between Italian children and the refugees is fundamental for our region,” Mr Aiello says. The bicycle can be the beginning of a new personal journey. To see a group of young people coming from different nations, who may not share a common language, helps them work together to achieve a common goal. Skills-building is just part of what SOS Children’s Villages Italy does to help unaccompanied and separated children at refugee centres near Crotone. “Our programme helps support the social integration of unaccompanied and separated children and young people in the area. We offer our support to those who flee from wars and persecution, and those who are forced to look to other countries to find better opportunities,” said Orso Muneghina, Head of the Emergency Response Unit for SOS Children’s Villages Italy. Provide a warm winter blanket. Provide a set of picture books for underprivileged children. Buy or repair a bicycle to transport goods. Provide an industrial sewing machine to grow a home tailoring business.